With just over a week left in 2016 and a few days before Christmas, it’s a good time to review your performance for the year. There are many facets of your life that can be reviewed and possibly improved on, so let’s take a look at some of them. Are you more financially stable now as opposed to the end of 2015? Did you improve your earnings? Did you reduce debt and save more? Did you increase your net worth? These are the basic questions to ask yourself to determine your financial health. In terms of my own financial well being, it’s been a challenging year. I’ve increased my earnings by about 10%, which can be mostly attributed to a raise at work and working a bit more overtime. However, my debt took a huge hit with the problems I had in one of my rentals. It’s not a crippling figure by any means, but it is enough that it will take discipline in order to pay off quickly. I’m hoping with a good 2017 that I can have it paid off by this time next year. Now on to saving money. Because of my debt, the money that I had earmarked for my savings account will be going directly into my line of credit to pay down my debt. Once the debt has been eliminated I have set up a weekly transfer of $100 into my savings account to build a rainy day fund. I also contribute $100 per week into my tax free savings account, and doubled my RRSP contributions after the shock of having to pay $2000 in income taxes. Overall, I think I’m doing ok. I did manage to increase my net worth to about $310,000, so to me that means I’m still headed in the right direction. Although this falls in the finance category as well, I wanted to keep bills in its own section. The most important thing here is: Did you reduce or increase your bill payments in 2016? Let’s take a look at some of the individual bills that most people get. Also, if you’re still one of those people with a home phone and a cellphone, perhaps it’s time to think about cancelling your home phone and just using a cellphone. If you’re worried about losing your home number, you can always get that number ported to your cellphone. The only thing I find still needs improving is 911 service. Your home phone is assigned to your home, so it’s very simple for 911 to determine your location. With a cell phone it’s not that easy, so the dispatchers rely more on the caller to pinpoint the location. Technology is always improving, so I would suspect that this will not be as much of an issue in the coming years. This is the one that has got a lot of attention this year. With the popularization of streaming services, providers like Bell have seen record numbers of subscribers leave traditional TV services. Of course the providers are fighting back to keep illegal streaming services at bay, but it’s a losing battle in a digital world. If you’re like me and live in a rural setting, the internet speeds that are available in urban settings have not made it to us yet. However, the CRTC has labelled broadband internet a basic service (as of Dec. 21, 2016), so it will improve but will obviously take time. With that in mind, I’m not able to (yet) take advantage of high quality live streaming, so I’m sticking with Bell for the time being. As I mentioned in a previous post about reviewing your bills, take the time to phone in to the loyalty department on a yearly basis to discuss your bill. Most time you will get a reduction, but keep in mind that the discounts do not last and you will need to phone in again. Insurance is one of those things we all need, but it doesn’t mean you shouldn’t review it on a regular basis to make sure your coverage is appropriate for your needs. Take the time to review your auto coverage for saving money opportunities. If you have a vehicle that you don’t drive in the winter, make sure you call up your insurance company and take your insurance down to basic coverage for those months you don’t plan on driving. Also, if you have insurance with multiple companies, take the time to request a quote from those companies to move all your coverage to one company. Often times there are multi-line discounts available. 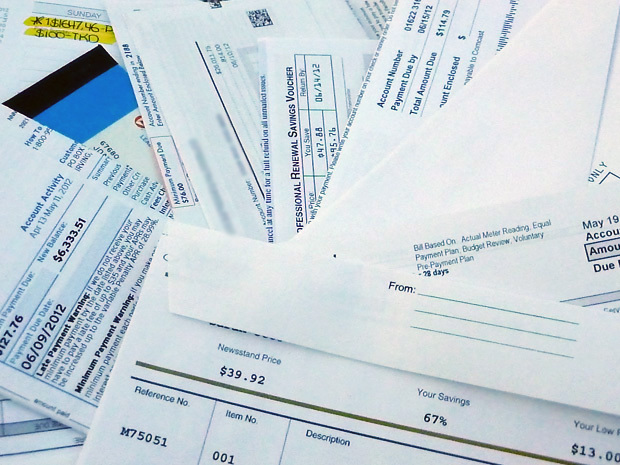 Saving money on your hydro bill is quite difficult in recent years. The government preaches energy conservation, but then raises prices because we’re not using enough to cover their costs. It’s a brutal mess the government has gotten themselves into and unfortunately it’s the taxpayers that get hit with the burden….sorry for the rant! Regardless of the above, we should all do our part to conserve energy. There are simple things you can do around the house, such as: replacing light bulbs with led, caulking/sealing windows and doors, timers on outside lights, unplugging components that draw phantom power, etc. All those things can add up to big savings. Use the New Year as a time to reflect on the things you did well and the things that need improvement. I know I did well earnings wise, but have work to do in the saving money department. Regardless of your situation, take the time to look everything over and see where improvements can be made. I’d like to take this opportunity to wish everyone a safe and Merry Christmas and Happy New Year!